When you’re moving fast over unforgiving terrain, you need an ultralight snowshoe that gives you confidence and power. The Lightning Ascent – Women’s from MSR answers the call with aggressive traction for tackling the steepest, iciest hills. It combines 70 points of 360° traction with a super-secure binding system and a low-profile frame that saves weight and improves agility with narrow gaits. The PosiLock™ AT binding system gives you ultimate control and the security to tackle steep climbs and traverses, and an Ergo Televator™ heel lifter makes those long ascents a little easier. For fast and light backcountry travel, the Lightning Ascent is what you want to have underfoot. Add on a pair of Lightning Tails (sold separately) for maximum flotation in deep, powdery snow or if you’ll be carrying a heavy pack. Other Features: Universal Traction: 360° Traction frames deliver edge-to-edge grip, and split teeth of Torsion2™ crampons better distribute forces for more continuous contact—delivering unmatched traction on any terrain, in any conditions. Secure Attachment: Two-piece, independently conforming Women’s PosiLock AT bindings create MSR’s most secure, freeze-resistant attachment for smaller footwear. As one of the volunteer instructors for a snow scramble course this weekend, I had to be prepared! Conditions called for lots of deep, fresh snow, so it was time to pull out the snowshoes. I have owned three different pairs over the years, and the MSR Lightning Ascents are hands-down my favorites–even more so after this Saturday! We arrived at Paradise Visitors’ Center in Mount Rainier National Park shortly after the Longmire gate opened. 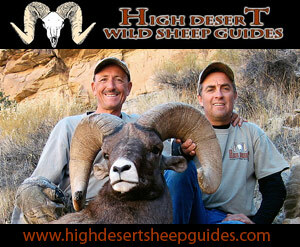 As soon as everyone was ready and the teams divided, our training began. Snowshoes went on as soon as we left the parking area and remained on most of the day. In the first 15 minutes of snow travel, we had to stop several times to allow students to readjust and change the fittings on their snowshoes. Not me! Mine fit beautifully from the get-go! 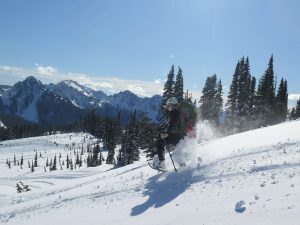 When we settled on the west side of Alta Vista for our primary training location and began climbing the slope, I was able to stay in the lead and break trail for my group thanks to the amazing Televators (aka heel lift). Breaking trail, especially in such deep snow, can be exhausting, and I found that not only did I maintain a strong pace but I arrived at the top with little fatigue and the energy to get to work preparing the hillside for our ice axe training. As a leader, it is important to keep some energy in reserve in case of an emergency, and I credit the Lightning Ascents’ amazing adaptability and efficiency to helping me do this. 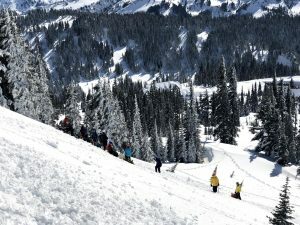 Later in the afternoon, my co-instructors and I decided to treat our group to an ascent up Alta Vista to admire the gorgeous mountain views and a fun glissade down (aka controlled sliding down the slope). We made part of the ascent without our snowshoes on and found ourselves post-holing up to our thighs. No thank you! 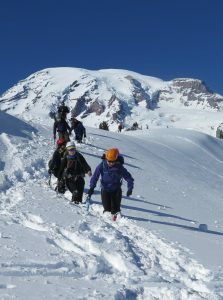 As soon as we finished glissading, I was back in my Lightning Ascents and my students quickly followed suit. The greatest moment of the day was when a co-instructor told me to run down the hill so she could get some action photos. I hesitantly agreed, picturing myself cartwheeling down the hill in a spectacular flailing yard sale of equipment, but I was willing to give it a try. 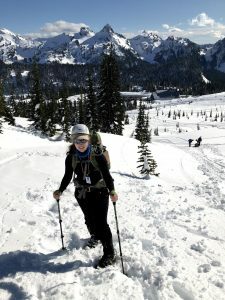 To my amazement, my MSR snowshoes stayed perfectly in place and I had a blast galloping down the hill (and got some really cool pictures as a result!). As the group snowshoed out, one of my students started asking about my MSR Lightning Ascents and seemed determined to acquire a pair post-haste. 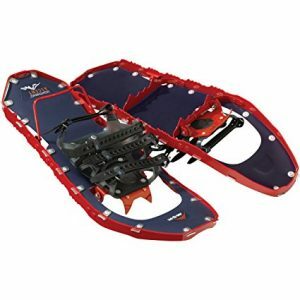 For anyone looking to take on bigger challenges in winter conditions, MSR Lightning Ascent snowshoes are a great way to go! Hard to make a suggestion because these have treated me so well! The only thing I can think of is including some sort of strap or device to help confused packers like myself attach these to our packs. 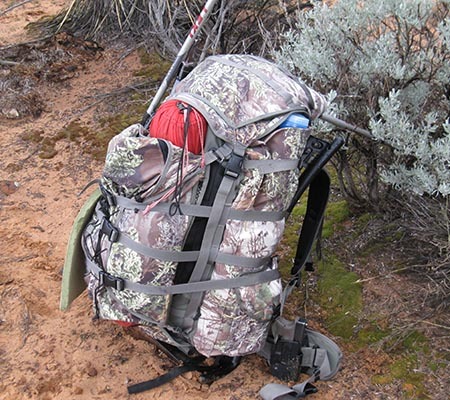 I have tried carabiners and a ski touring strap and both have worked reasonably well, but it always feels awkward attaching the snowshoes to my backpack. Maybe a built in rung or loop to make it less awkward to feed carabiners through the edges of the snowshoes? 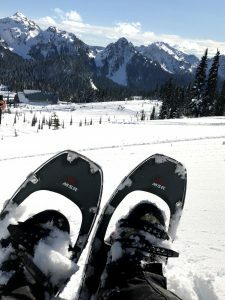 Or idiot-proof instructions on the snowshoes themselves might help, too.